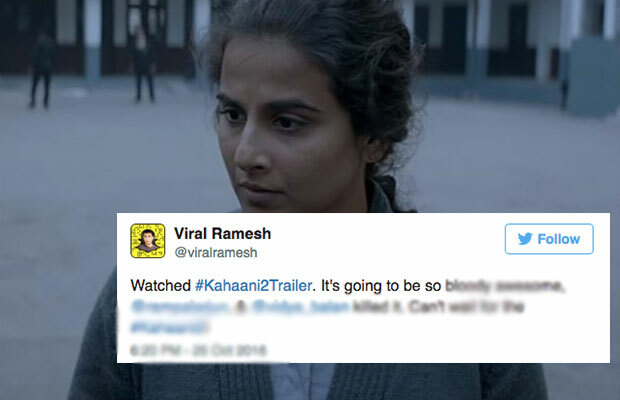 Today, the trailer of Vidya Balan’s thriller Kahaani 2 released and the trailer will surely shock your senses. The trailer looks mysterious, gripping, intriguing, and it will leave you baffled. You cannot figure out whether to doubt or pity Vidya in the trailer. The film also stars Arjun Rampal as a cop. Directed by Sujoy Ghosh, the film is an installment to 2012 hit film, Kahaani. The film is releasing on December 2. As soon as the trailer came out, fans took to their Twitter to share their views. Their views will definitely amaze you. Watched #Kahaani2Trailer. It's going to be so bloody awesome, @rampalarjun, & @vidya_balan killed it. Can't wait for the #Kahaani2!
. @vidya_balan's #Kahaani2 is going to be the movie of the year! The trailer is so so so promising that it's unbelievable! Good luck!! "The Truth lies in her Story"
Waiting for #Kahaani2 .. briallnt trailer #Kahaani2trailer .. vidhya..
Next articleWatch: Hrithik Roshan And Yami Gautam’s Starrer Kaabil Trailer Will Leave You Spellbound With Stunning Visuals! !